You might have heard that Deborah of Whipstitch is introducing a new series of sewing patterns. The 'Learn As You Go' patterns are great, whether you're a beginner or a more experienced sewist. I had the opportunity to test out the Get Up and Go Skirt last week, with wonderful results! Let me start by saying, this is really more than a pattern. Deborah provides videos for each step of the way, which can help you through any difficulties. You can ignore them, but if you are sewing your very first thing ever, the videos will guide you on your journey! I consider my self an intermediate garment sewer, but I watched most of the videos, and learned a few new things. Deborah also provides a checklist as part of the pattern. For list-loving people (like myself), I enjoyed checking off each step as I went. Oh, and Deborah gives you an option to print ONLY your size. It is so much cleaner than multi-size patterns, and helps to prevent cutting (or tracing) the wrong size. The skirt came together pretty quickly. I always recommend cutting/prepping fabric one day, and start sewing after a break. 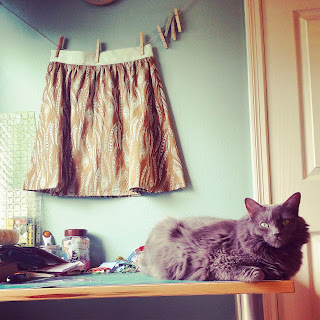 I tend to rush through the sewing if I'm tired from the prep! For my first version, I chose a voile fabric, and I just cut out a second skirt from this fun Jeni Baker Geometric Bliss print. I see myself making many more Get Up and Go skirts in the near future! 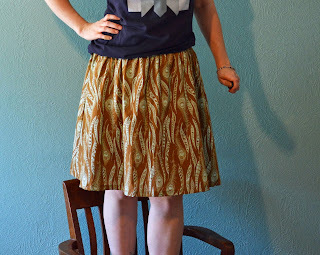 I really recommend that you check out the Get Up and Go skirt, and keep an eye out for future Learn as You Go patterns from Whipstitch!